The list of my friends that are having babies just keeps growing! For the past couple of years, my go-to gift for baby girls has been the Itty Bitty Baby Dress from Made by Rae (a few of my versions here and here). However, for Christmas I got a copy of Handmade Beginnings, a sewing book full of projects for babies, for moms-to-be, for dads(!) and for the home. I was pleasantly surprised by how many projects in the book could very easily be for non-baby applications – pillows, quilts, a messenger bag, etc. I marked a bunch of projects I wanted to try, and one was the “cute as a button” booties, which seemed perfect for a new-baby gift. 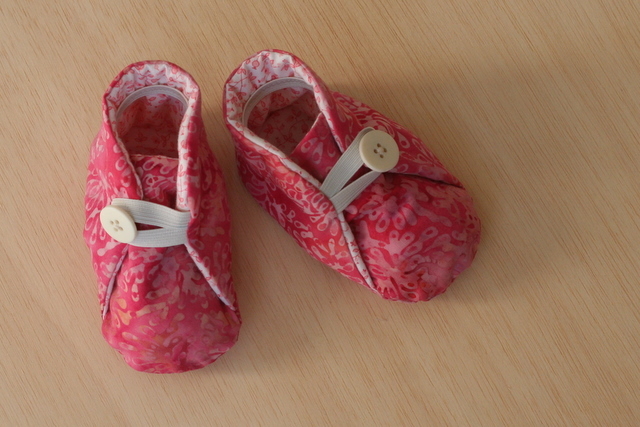 Conveniently, my sister gave me some fabric over Christmas that she had cut out for a tiered skirt years ago and has since given up on making, which happened to include some pink prints, perfect for a pair of baby booties. 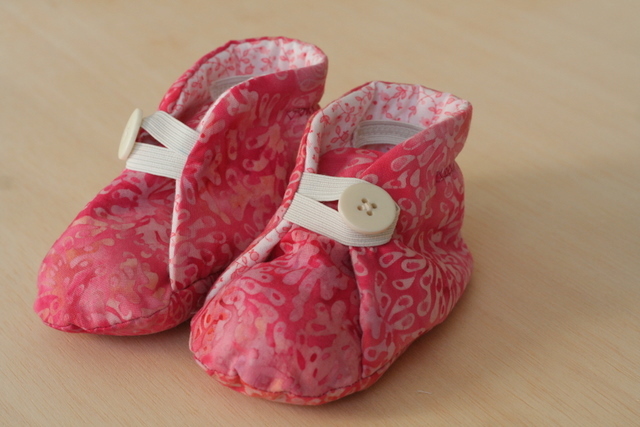 These booties took a little over two hours to make, and came together pretty easily. Next time I might alter the inner sole, which is attached via fusible interface. I’m a little unsure if the soles will actually stay attached that way. Has anyone relied on interfacing to connect fabric pieces? Does this really work? This entry was posted in childhood, clothing, fabric, finished. Bookmark the permalink. Love these. Where did you get the pattern? Glad you like them! The pattern is in the Handmade Beginnings book by Anna Maria Horner. Hi Kate! I agree about hand-stitching the inner sole – I actually just made a second pair of these a couple of weeks ago and did the same thing. Seems much more secure than just fusing it together. Great idea about the elastic as well!